A relation (V,V,E) is equivalent with a directed graph (V,E), where E⊆V×V is the set of edges and V is the set of vertices. then zswap zover zet= \ E s" s=s"
The next word merge the set on top of zst into the set on top of the xst leaving the result in xst. 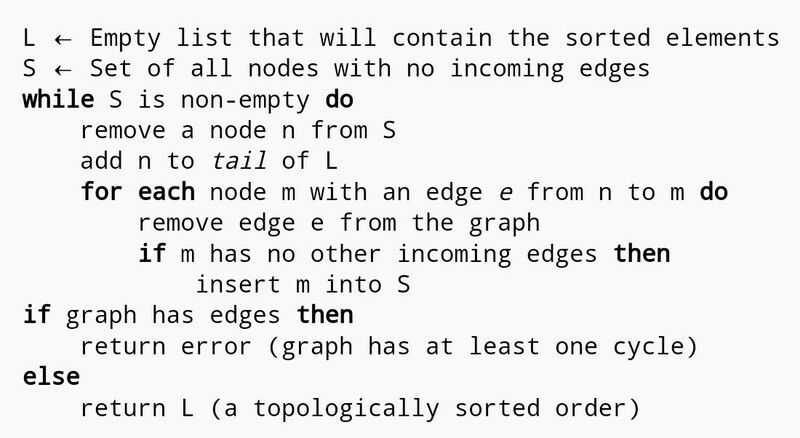 Given a directed graph (V,E), a topological sort is an ordered list including all the elements in V once, (x1,...xn), sorted so that if there is a path from xi to xj, then i<j. Such paths exist if and only if there are no directed cycles. 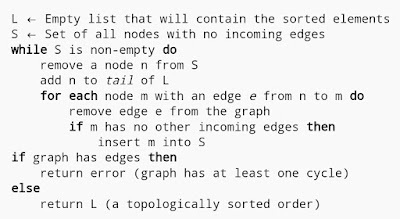 dup zdup >zst zfence \ build set of all nodes..
A loop is an edge from a node to itself and loopset gives the edge set to a graph in which all edges are loops. Can be used to filtrate the loops from digraphs. Generate a random digraph with certain number of vertices and edges. Already the two first edges builds a directed loop. 10 20 rand-acyclic-digraph zdup cr zet.